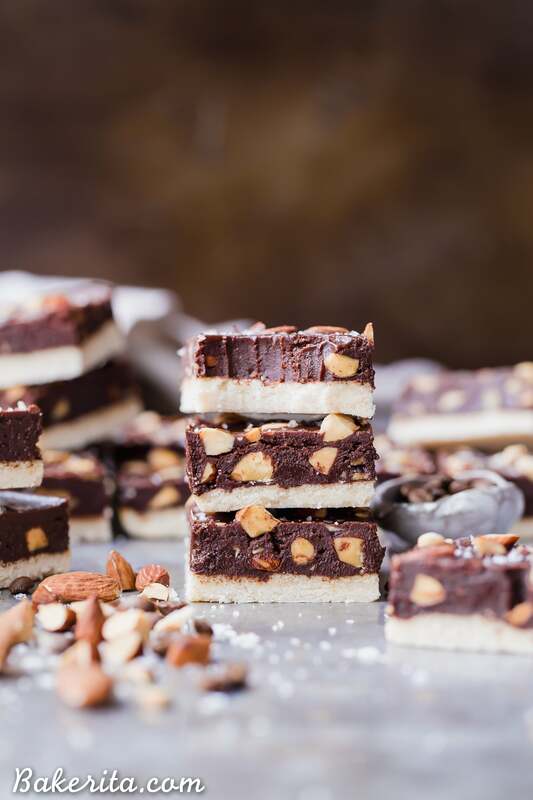 These Mocha Almond Fudge Bars are incredibly rich and delicious, with a chocolate-coffee fudge studded with crunchy almonds, all sitting on top of a simple shortbread crust. 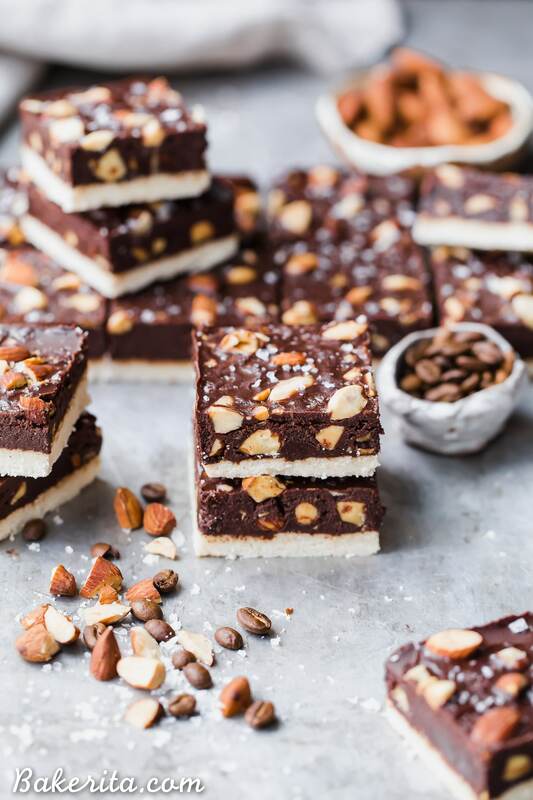 These gluten-free, paleo and vegan fudge bars are irresistible! I’ve got three words for you that are pretttyyy irresistible: MOCHA. ALMOND. FUDGE. You’re hooked, aren’t you? I know I was as soon as the words flew into my head and put themselves into a perfect little bar that needed to be made ASAP. They’re super easy to make (you guys probably know by now that’s how I like to roll) and almost no-bake. The crust needs to be baked for the good, crunchy shortbread crust factor, there’s no baking (or even cooking) for the top layers. Just a little melting and stirring. FIRST – that shortbread crust! It’s so simple and similar to the one I use for my favorite/almost famous Homemade Twix Bars. Only three ingredients: coconut flour, because it’s so absorbent it helps totally replicate that shortbread-y texture; maple syrup, for a little sweetness; and coconut oil, to help with the crunch factor and holding it all together. The next layer is my fave…that mocha almond fudge goodness. 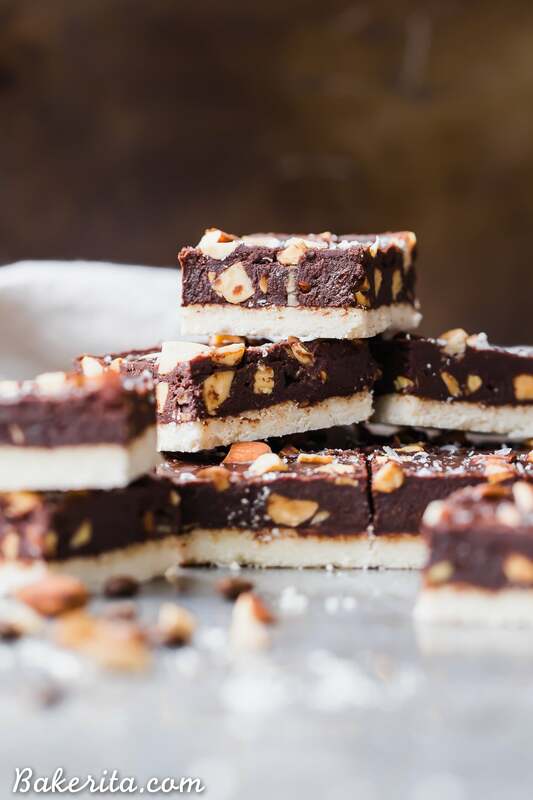 It’s literally a layer of fudge, infused with espresso powder and toasted almonds to add a whole new dimension of flavor to the fudge. The coffee adds warmth to the fudge and the almond butter helps bring out the almond flavor even more. Quick tip: I’d stick with instant espresso powder here instead of instant coffee – it has a lot stronger depth of flavor, and instant coffee won’t give the same effect unless you use a lot more of it. If it’s all you have, taste as you go to make sure it tastes as “coffee-like” as you prefer. On top of the fudge layer is a simple layer of homemade chocolate – just a combo of coconut oil, maple syrup and cocoa powder. You can sub with some melted chocolate too if you prefer. Top that with crunchy chopped almonds and sea salt (if you’re like me and like flaky sea salt on top of every chocolate dessert) and you’re golden! 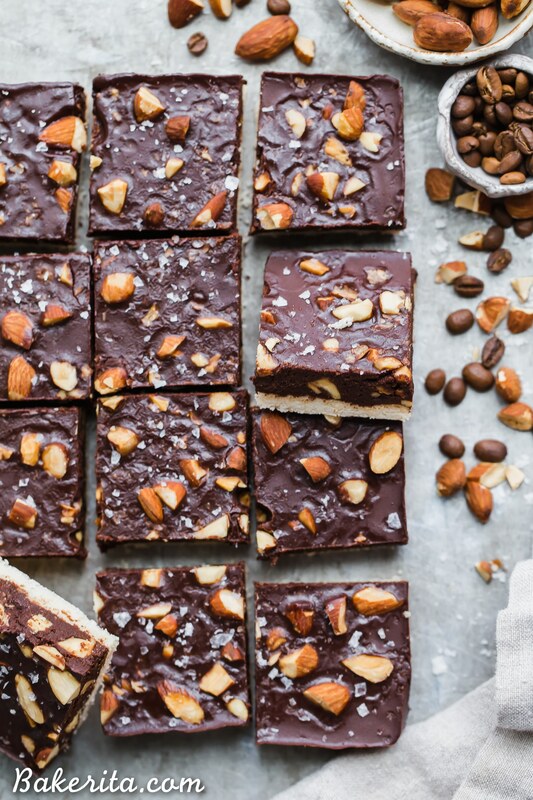 If you’re a fan of chocolate, or coffee, or almonds…I think you’ll be into these. Hope you give them a try and enjoy, my loves! You’re the greatest, and don’t forget it :) sending you lots of love today and every day! Combine the maple syrup and room temperature coconut oil and mix until combined. Add the coconut flour and mix until a large dough ball forms, pressing out any clumps of coconut oil. For the filling, combine the espresso powder and melted coconut oil and stir together to dissolve the espresso powder a bit. Add the rest of the ingredients and whisk or stir together until completely combined. Pour over the crust and let cool in the refrigerator until set before topping with chocolate layer. For the chocolate topping, whisk together all of the ingredients and pour over the cooled fudge layer. Smooth evenly and sprinkle with almonds and flaky sea salt. Let cool until set. Slice into 16 squares. Keep stored in an airtight container in the refrigerator. 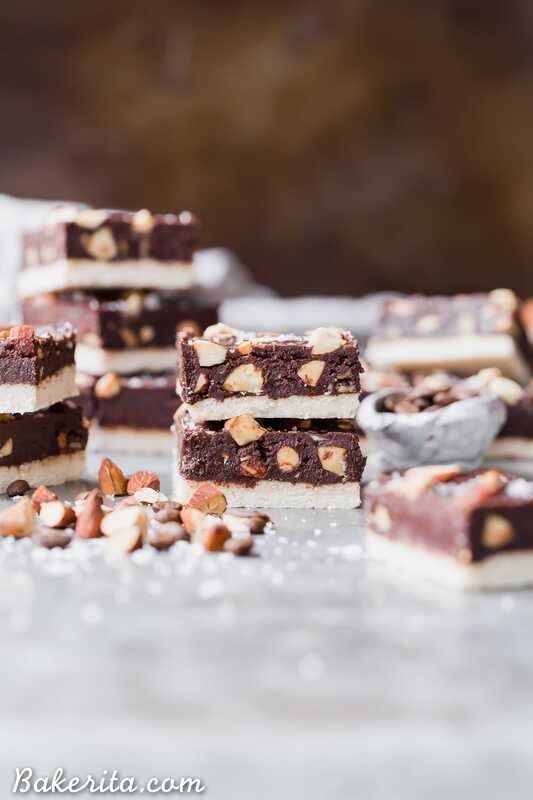 Mocha almond fudge is the best, these bars look incredible! Thanks so much for the love, Laura! 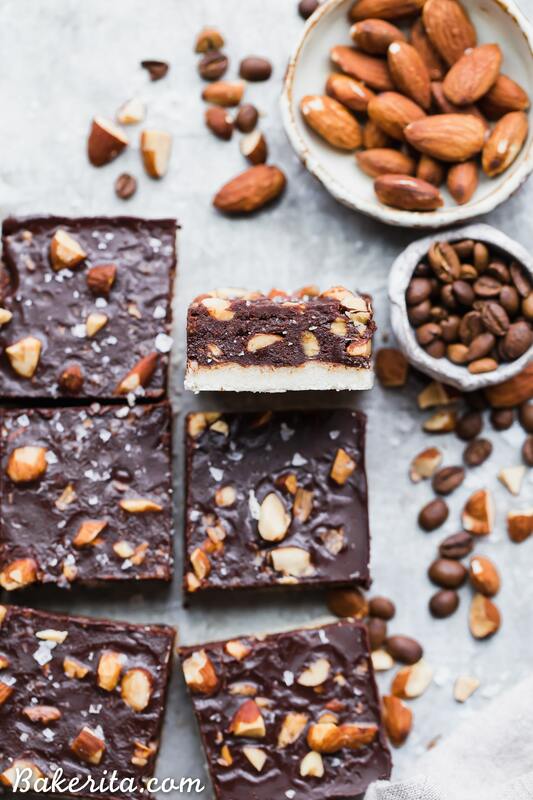 I am a HUGE fan of coffee, chocolate, and almonds…these bars look heavenly!!! Then these were MADE for you!! Hope you love them Brittany!